That’s No Cow, It’s a Camel! Noah Peachy’s farm, one of only two camel dairies in Pennsylvania, sits along Route 405, outside Montgomery. Several camels stand in his fields, forcing motorists to do double-takes and stop to take pictures of these giant, grass-nibbling creatures to show to their friends. Little is known about why camels are in Pennsylvania or how they fit into the farm structure. Theories range from selling the milk to local hospitals for research to keeping the animals for personal enjoyment. The real truth undoubtedly lies somewhere in the middle. Camels are the oldest domesticated animal in the world; they spent the majority of their time throughout history in contact with humans, not in the wild. Although many people are unaware of the presence of camels in the United States, they were introduced into the U.S. shortly after the Mexican-American War as a means of transportation for the military in the desert-like southwest. Maj. Henry C. Wayne was assigned to procure camels in 1855 from places like Malta, Greece and Egypt. The camels proved to be exceedingly strong and able to move quickly across terrain that horses found difficult; their ability to go long distances without water was also a valuable asset. The U.S. Camel Corps was abandoned at the start of the American Civil War and most of the camels were sold to private owners. Today there are multiple camel farms across the United States, but the animals are not primarily used for transportation. Many of the farms are members of the Camel Milk Association, a private group whose members seek to help each other achieve better health and live longer with quality products like raw camel’s milk. These benefits help explain why many farmers across America, including Noah Peachy, are starting to delve into this unique way of farming. Around the world, camel milk is considered healthy and nutritious - and a staple to treat disease. Camel farms in the U.S. are on the rise. The association was started because, until recently, it was illegal to sell camel’s milk in the United States. Each state has laws that govern the sale of milk—any milk. As with any unregulated product, consumption of raw milk of any kind is discouraged, and must done at your own risk. This is why farms in the association do not sell milk directly to consumers; the milk must be obtained through proper channels. 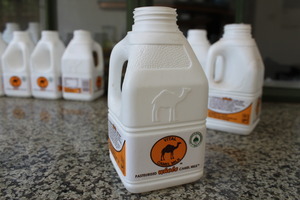 Although camel’s milk is not currently regulated by the FDA, USDA or other state milk boards, there is anecdotal evidence linking the raw milk to health benefits, including: reduced insulin dependency for Type 1 diabetics; reduced allergy symptoms in children; boosts to immune systems; and reduced symptoms and improved motor skills in autistic children. In addition, preliminary studies have been conducted to determine whether camel’s milk can be consumed, without undesirable side effects, by people intolerant to lactose. Marlin Troyer, of the Camel Milk Association in Michigan, says that although lactose is present in camel’s milk, it is frequently not the lactose, but the proteins present in both cow and camel milk that typically cause allergic reactions (or anaphylaxis). The protein in camel’s milk has a shorter, simpler structure than cow’s milk. This may be why it is better tolerated by people with allergic reactions to cow’s milk. There is a wealth of information on the Internet pertaining to the benefits, and risks, of consuming raw camel’s milk. As with any new potential food supplement or product, it is important to obtain the facts and make decisions with the aid and advice of your physician. The Camel Milk Association’s Web site (camelmilkassociation.org) provides information ­­about camel’s milk, including the nutritional content, videos about the milking process and how to become a member of the association. Studies and books are also underway about this exciting new food supplement. For now, watch your local farm fields for these unusual and fascinating animals. You never know where and when they might pop up. Written by Sue A. Fairchild, a freelance writer and editor who also enjoys writing her blog, Sue’s Simple Snippets, which focuses on finding the simple joys in life.